Okay, so I have decided to start giving my reviews ratings (see right hand side of blog to get the guidelines for these ratings). So I’ll start with Spindle’s End! I picked up this book after reading Beauty earlier this year. I really enjoyed Beauty, and I loved the way McKinley retold the fairy-tale. So, I decided to give Spindle’s End a go. The story begins with a tale that is more or less familiar to anyone that knows the original fairy-tale of Sleeping Beauty. The king and queen have a daughter, but on the celebration of her birth, a vengeful fairy intrudes on the celebration and curses the princess; in this version of the tale, the evil fairy is named Pernicia, and she puts a curse on the princess that states that she will prick her finger on a spindle end on her 21st birthday, and die. A peasant fairy named Katriona, who was watching the celebration, runs to protect the baby, and ultimately takes the princess home with her to raise in secret. The princess, named by the peasant fairy and her aunt (usually called Aunt) as Rosie, grows up into someone totally unlike a princess; she wears trousers, works in a smiths yard, and pretty much hates all things girly. When she is almost twenty-one, however, she learns of her heritage, and in an effort to confuse Pernicia, Rosie’s best friend Peony, who is very much the opposite of Rosie, pretends to be the real princess. On Rosie’s birthday, Pernicia shows up to the celebration, and although she is not fooled by the trick, Peony still manages to prick her finger on the spindle end before Rosie can, spoiling the curse. Nearly everyone falls asleep, though Rosie is woken by the man she is in love with, and they, together with various animals, set off to find and defeat Pernicia. Eventually, they are victorious, and in the end, Rosie gives Peony the kiss to wake her up. Rosie does not want to be the princess, however, and Peony continues to hold the position, while Rosie stays where she is, and learns that the man she loves loves her in return. Okay, so, in the beginning, I really liked this book. I loved the character of Katriona. She was strong and determined, but at the same time, she was just an average girl; there was no huge destiny waiting for her, and that was perfectly okay. The first part of the book follows Katriona, as she escapes with the baby princess, and raises her with Aunt, pretending that she is a cousin. Once the narration switched from Katriona to Rosie, however, I was less enthused — that is not to say I disliked the book, but I was less impressed than I was during the first part of the story. I didn’t really enjoy the character of Rosie. I thought she was far too stereotypical, the anti-girly girl who has no place being a princess. She hates everything girls are supposed to like, from long hair to dresses to spinning to dancing, and I think I would have been a lot warmer to her character if she had had personal likes and dislikes; she could have disliked dresses, but enjoyed doing embriodery work, or she could have disliked dancing, but enjoyed playing with her hair. I just found her dislikes of girly-things too much. With that said, I still enjoyed the story. I liked the fairy-tale world; long, long ago, and far, far away, in a world where there is certainly magic, but many people still live regular lives despite the magical influences that appear every so often. The world is well thought out, and McKinley does a good job (although her descriptions can certainly get tiresome after awhile) of explaining the details of how the world works. 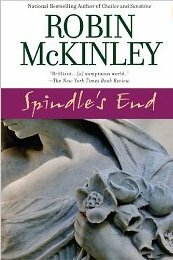 My biggest issue with Spindle’s End was with the ending. The whole final confrontation between Pernicia and Rosie is just strange, and felt rather rushed…it all happens in fifty or so pages, and the whole incident is rather bizarre, feeling kind of out of place with the rest of the story. However, I can even put this aside. What I could not make my peace with, on the other hand, was how Peony kept pretending to be the princess after everything was over, how everyone (including the royal family, and thus, Rosie’s actual family) think Peony is the true princess, and Rosie’s life goes on more or less like nothing ever happened (except that her best friend is now the princess). I would have really enjoyed this book if Rosie had confronted the future that she did not really want, and took the on the challenge because it was her destiny and it was what she had to do, for herself, her family, and her country. I thought it was, well, kind of stupid that Peony just took over the role and no one thought anything of it, and I thought it really damaged the strength of Rosie’s character, that she ignored her destiny because she didn’t think she would be any good at it. I would have much rather seen her step up and be a strong princess, redefining what a princess could do, and bringing her country victory against the darkness of Pernicia. So, all in all, this book was good, but not great. The end really ruined it for me, I think, and unfortunately, the end was the last part I read, so it remains in my memory better than some of the great parts earlier on. ***1/2.